After several years of learning about natural remedies, a good detox bath is one of my favorite ways of kicking a cold fast. Taking a detox bath will help your kids relax, clean their systems of toxins, and absorb wonderful minerals that will strengthen their immune systems. After a full day of activities, your kids are feeling miserable because of a cold. They are cracky, congested, irritable and just a mess. 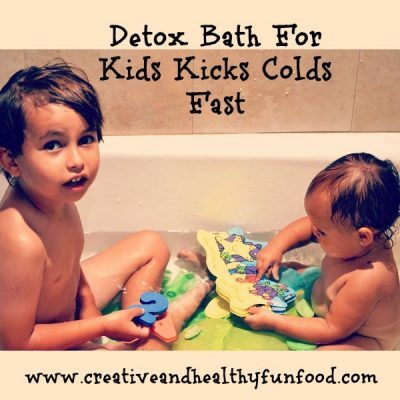 How To Kick Colds Fast With a Detox Bath is the perfect way to make your kids feel better and relaxed when they are sick. In my experience, it really helps. My 5 year old son caught a cold a few weeks ago. The same day he started to show cold symptoms, I made sure to give him a detox bath. He slept for 12 hours straight afterwards! He woke up the following morning feeling much better. This is when I realized I had to write a post about detox baths. Your kids are exposed to a lot of toxins from pollution, household cleaners, and processed foods that are full of chemicals and additives. A detox bath with magnesium has the power to eliminate those toxins. So it is also a good idea to just give your kids a detox bath once a week, even if they are not sick to keep their immune systems strong and free of toxins. I try to take a detox bath once a week too. It is so relaxing and I feel completely rested and energized the following day. If you want to learn all about detox baths and why you should take them, please see this wonderful article HERE. It explains in depth all the wonderful benefits of taking a detox bath. Studies have shown that magnesium and sulfate are both readily absorbed through the skin, making Epsom salt baths an easy and ideal way to enjoy the associated health benefits. Magnesium plays a number of roles in the body including regulating the activity of over 325 enzymes, reducing inflammation, helping muscle and nerve function, and helping to prevent artery hardening. Sulfates help improve the absorption of nutrients, flush toxins, and help ease migraine headaches (source). Kids: All you need is 1/2 cup of Epsom Salts, and 2 tablespoons of baking soda (To help promote elimination of toxins and clean unfiltered water). Adults: use 1 cup of salts and 4 tablespoons of baking soda. Optional: You can use a few drops of essential oils. I like Eucalyptus Essential Oil for detox baths (not recommended for small children). For small kids you can use Lemon Essential Oil , great for supporting a healthy immune system, or Lavender Essential Oil which has a nice calming effect. It is important to use KidSafe essential oils and dilute according to instructions. For more information, please check out safe essential oils for children. There is a fantastic variety of safe oils for children above the age of 2. Fill the bathtub half way with warm water. Place the salts and baking soda, and stir with your hand to dissolve. Take a bath for at least 15-20 minutes. The body will extract the toxins first, and then start to absorb the minerals. To distract kids, you can play with toys or read a book. Make sure they do not drink the water. Magnesium has a laxative effect. Rinse well afterwards and towel dry. The detox bath is now complete. Have some drinking water available. A detox bath can make you very thirsty. Magnesium also promotes sleep so you or your kids will soon be ready for bed. Now you know How To Kick Colds Fast With A Detox Bath. At the first sign of a cold, give your kids this bath and see for yourself the wonderful results. If you are interested in more natural ways to strengthen the immune system, please see 7 Ways To Boost Immunity And Get Ready For Flu Season. ***UPDATE*** Several people are telling me their kids do not sleep well. This detox bath definitely helps my two kids relax and sleep better. If you are also looking for a kid’s multivitamin that has magnesium, please check out Natural Vitality Kids Natural Calm It is good for kids 4 years and older. I give this to 5 year old son and it works great. Contains magnesium, Omega-3 DHA & EPA, and 24 organic fruits & veggies. Magnesium is a miracle mineral. I take it myself, and it has helped me a lot when dealing with anxiety (see my personal experience here).